What you should replace Monopoly with depends on what you go to Monopoly for. With that in mind, here are some alternatives. 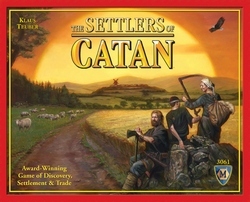 The Settlers of Catan – This game simply can’t be ignored in any discussion like this. In 1995 Klaus Teuber took the boardgaming world by storm with this game. It started a renaissance in gaming like no other. And the reason? It’s a wonderful game. Easy to explain, fun to play, carried by both luck and skill. If you admire Monopoly for the feeling of scope, of watching a sort of narrative evolve, this is the game for you. This is the game that started many folks (including myself) on a path to hobby gaming, and fifteen years later I still enjoy playing it. Settlers is a game in which you build settlements, cities, and roads on a randomly-built map of an island. Each space on the island produces resources that you use to build with. The more you build the more resources you get and therefore the more you can continue to build, until you get enough victory points to win the game. There are folks who complain about the use of dice in the game, who say that this random element makes the game too unpredictable and can kill a player who has picked a lousy starting position. These people are whiners and should be ignored. 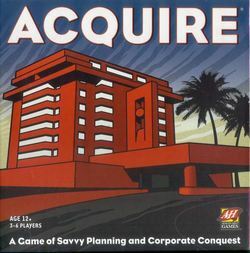 Acquire – Another game you can probably find at your local Target or Toys ‘R’ Us, Acquire is a classic. If you like the wheeling and dealing of Monopoly, this is a much more satisfying game. Your goal is to invest in hotel chains and get paid fat cash when they merge into bigger chains. Yet it’s surprisingly easy to learn–this is a game that used to have the rules printed on the inside of the box lid; remember those? There’s a fair amount of bluffing, strategy, (and, yes, a little luck) that you’ll be able to use in order to crush your opponents with your financial wizardry. A horrible toupee is completely optional. For Sale – Let’s say you’re itching for a financial game but, being a real-life mover and shaker, you just don’t have the time for even an hour-long game. 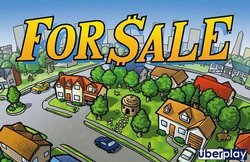 For Sale lets you scrap with others to make big real estate cash, and does so in about twenty minutes’ playing time. It also doesn’t take up much space, so you can bring it to the restaurant and play while you’re waiting for your food. The gameplay is fast and easy. In the first round you buy various properties ranging from a cardboard box in an alley to a space station. In the second round you sell your properties to ensure step 3: Profit! There’s a good amount of faking out your opponents in order to get the good properties and selling at the right time in order to make maximum cash off of them (play right, and you can get a fortune for that cardboard box.) For Sale is fast, fun, and cheap, like…someone else’s mom. I’d never talk about your mom like that; she’s a dear. 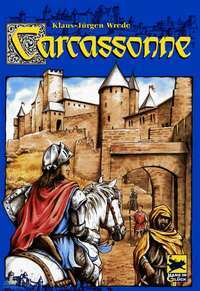 Carcassonne – The Carcassonne series has a very simple premise: you are laying down square tiles with landscape features on them in order to complete roads and villages and such and score points. Very straightforward, very simple. And the beauty of it is, you can easily play it in such a way that everyone gets along and nobody cries, or you can get completely mean and vicious with it; it’s up to you. If your favorite part of Monopoly is spending time with the family, this is a great game for you. If your favorite part is destroying the dreams of your vict–ah, your opponents, this is also the game for you. Carcassonne also has gobs of expansions you can add to the mix if you get tired of it as-is. One caveat: there is a bit in the original Carcassonne that many new gamers sometimes have trouble understanding — scoring farmers. It seems to be a total crapshoot whether or not people have a problem with this. One of the spin-off games, Carcassonne: Hunters and Gatherers, fixes this issue and, for some people, is an even better game than the original. Results may vary. Coloretto – This is more of a game for fans of Uno, as it’s a card game with a very big “take that” element, but it’s also good for folks who appreciate the competition in Monopoly. 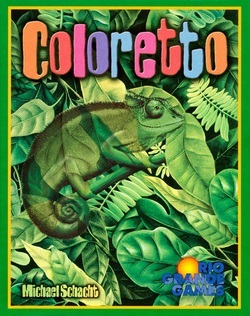 Coloretto, with its colorful chameleon cards, looks on the surface like a peaceful, simple, almost kid’s game. That is not correct, though. It is a spiteful, vicious game about trying to put the screws to all the other players. The concept is easy: on your turn you either play a card into a row or take an entire row. However, you’ll only get positive points for three of the colors you collect; any colors beyond that will hurt you. So naturally you want to poison the rows for other players by adding colors they don’t want. Coloretto is a very attractive game that’s easy to learn, plays fast, and can cause emotional scars that are almost as deep as those Monopoly can create. Incidentally, if you want a bit of a gentler and fuzzier Coloretto, the basic concept of the game has been translated to the game Zooloretto, which adds a zoo theme and a few more bells and whistles to it. I prefer the straightforwardness of the original game, but Zooloretto is a little more family-friendly and, for many people, more satisfying. 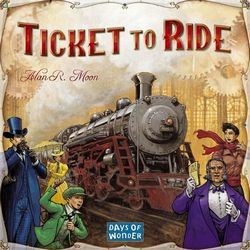 Ticket to Ride – This game is not like the others, but it’s here for an important reason: people love it. People who don’t play any other games love Ticket to Ride. It’s not like Monopoly at all. You’re building train routes and matching sets of cards, and there isn’t any trading and very little screwing of your opponents, and people absolutely love it. If you play Monopoly just because you like getting together and playing games, and you want something that the family, the kids, Grandma, and Uncle Drinky can all get together and enjoy, this is an excellent game to consider. 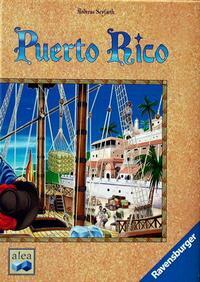 Puerto Rico – I’m including this as a bonus option because it’s much more complicated game than the above. Still, it’s widely considered to be one of the best hobby games out there, and there are folks for whom this, not Settlers, was the game that got them into boardgaming. It’s a game about amassing wealth and resources, erecting buildings, developing plantations, selling goods, and ultimately gaining victory points. If you crave “big picture” games where you gradually carve out your empire, this is one to consider. Right there are six games and one bonus one that should easily replace Monopoly in your game closet. Unlike Monopoly, I bet most of them would get played more than once in a blue moon. Apart from Puerto Rico (which isn’t that tough) none of them are very difficult, and none of them take hours upon hours to play. There are tons more I could have put on there that I think also would have fit the criteria: Power Grid, Dominion, Pandemic, Small World — believe me, I could go on for hours. I’ll be talking about some of these in upcoming columns. Now, go play some good games. You need never take a ride on the Reading again.